Hi friends! Today I’m bringing you another DIY. I know I say this about just about everyone, but this one really is one of my favorites! These ‘be still’ prints actually have quite the story behind them… I’d originally ordered them on Etsy for about $50 (yes, $50!) and I’ll-save-you-the-long-story but the order was never filled and I got a full refund. At this point, my mom had already bought me these 18x24in black frames as part of my room makeover (from bright pink and teal to a more mature black-white-and-gray). So what’s a girl to do?! DIY those beauties myself. I was able to make my own prints for less than $5! Personally, I think these turned out pretty great considering I saved myself a nice chunk of change, aaaand I have the satisfaction of doing something myself. My mom and sister couldn’t believe how well these turned out with just a few hours of work. I’ve always loved Etsy and ‘shopping small’, but as an Etsy shop owner myself, I also know how to properly conduct business and treat customers. I wasn’t happy with the way the store owner handled my purchase of their prints, so I’m glad I was able to end up with something I love anyway. 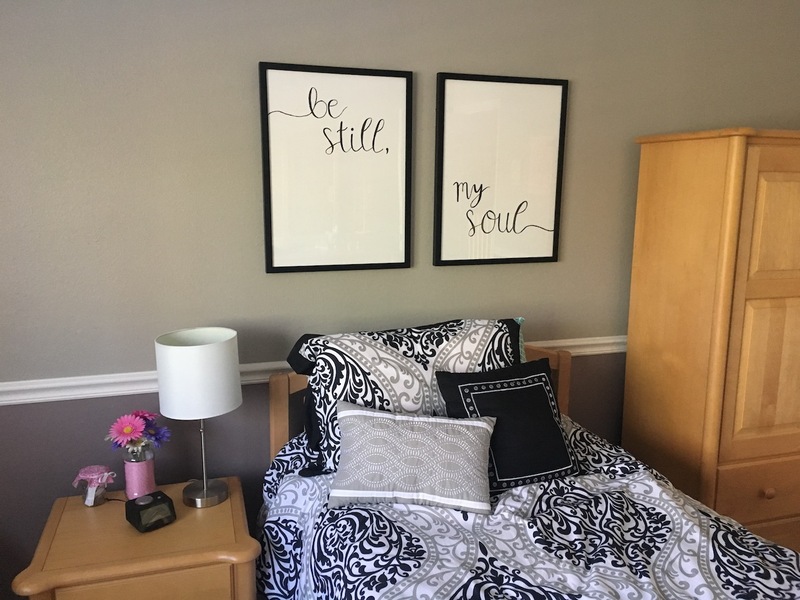 These ‘be still my soul’ prints are all over Pinterest, and I was originally inspired to have my own when I saw them in Aspyn Ovard’s (the popular Youtuber-blogger) own room. Instead of ordering another set from Etsy or Pinterest, I went thrifty and got creative on my own. And yes, that is it! Bringing this project to a grand total of $4, including tax. Like I said, the frames were a gift from my mom, but you can find similar ones for $10-15 from Target, Walmart, or any craft store. You could also use poster markers or paint, which may work just as well. The sharpies weren’t the best marker to use, as the finish of the posters dried the tips pretty quickly, but I was still able to get the look I wanted. I pulled a few inspo-pictures from Pinterest, cut the posters to size, and set up shop on the floor of my parents’ bedroom (where I had enough space to work) and got to crafting. I did the lettering for these prints the same way I do the paintings for my store, in the pseudo-calligraphy method. I first did a thin outline to space the letters, and then I went back to thicken the strokes and connect the letters. These were definitely the largest items I’ve ever crafted, and I’m used to painting cursive on much smaller surfaces! Once I finished the lettering, I popped them in the frames and hung them with my dad’s help. Overall, I love the way they turned out! And of course, I love that I was able to do them myself, for much less $! If you liked this post, please share it on Pinterest with the image below! I’ve always wanted that “be still, my soul” image ever since I came across it on Pinterest, but as I was searching on Etsy, they are so expensive! Your version looks so nice, great job!